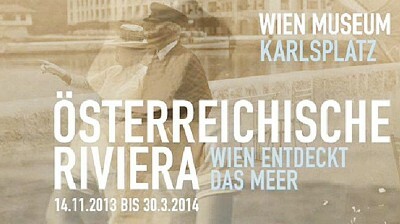 The exhibition Austrian Riviera – Vienna Reveals the Sea (Österreichische Riviera – Wien entdeckt das Meer) was opened in the Vienna City Museum in the middle of November 2013. The exhibition is a historical journey to favourite destinations of the Austrian-Hungarian Monarchy. Approximately 450 exhibits chronologically leads visitors from the opening of the Vienna – Trieste railway in 1857 to the great exhibition Adria in Prater in 1913. The „Austrian Riviera“ was in full tourist bloom in during precisely that period (1890–1914). It was helped by opening of the Monarhy’s railway network which connected Rijeka, Opatija and the Kvarner Gulf to Vienna in 1873. Traffic connections and suitable climate accelerated the development of health, family, fashion and art tourism. Larger Dalmatian cities (Split, Dubrovnik, Budva) were encompassed in addition to the Northern littoral. Numerous regional museums (from Trieste, Rijeka, Split, Opatija, etc.) provided their materials for the exhibition.